The aim of the study is to characterize the local muscles motion in individuals undergoing whole body mechanical stimulation. In this study we aim also to evaluate how subject positioning modifies vibration dumping, altering local mechanical stimulus. Vibrations were delivered to subjects by the use of a vibrating platform, while stimulation frequency was increased linearly from 15 to 60 Hz. Two different subject postures were here analysed. Platform and muscles motion were monitored using tiny MEMS accelerometers; a contra lateral analysis was also presented. Muscle motion analysis revealed typical displacement trajectories: motion components were found not to be purely sinusoidal neither in phase to each other. Results also revealed a mechanical resonant-like behaviour at some muscles, similar to a second-order system response. Resonance frequencies and dumping factors depended on subject and his positioning. Proper mechanical stimulation can maximize muscle spindle solicitation, which may produce a more effective muscle activation. Vibratory stimulations transferred to the whole body, that is, whole body vibrations (WBVs) treatments, have recently arouse a great deal of interest. WBVs are widely studied in the fields of exercise physiology, sport, and rehabilitation medicine [1–4]. Many studies have indeed accounted for their impact on metabolic and hormonal activity, neuromuscular response, and postural control [5–21]. WBV training aims to mechanically activate muscles by eliciting reflex neuromuscular activity. In such treatments, vibrations are generally delivered to the body as a whole by the use of vibrating plates, while muscular activity estimation is assessed analysing the simultaneous electromyography (EMG) activity, in particular the EMGs root mean square (RMS)values. These vibrating devices produce vertical sinusoidal oscillations (or alternating rotation) of a platform across a frequency range from 10 to 80 Hz and peak-to-peak displacements from 1 to 10 mm [3, 22]. Mostly, individuals undergoing WBV treatments are requested to hold a specific position onto the plate. Vibratory stimulation, impressed by the platform, transfers to the muscles through the body. 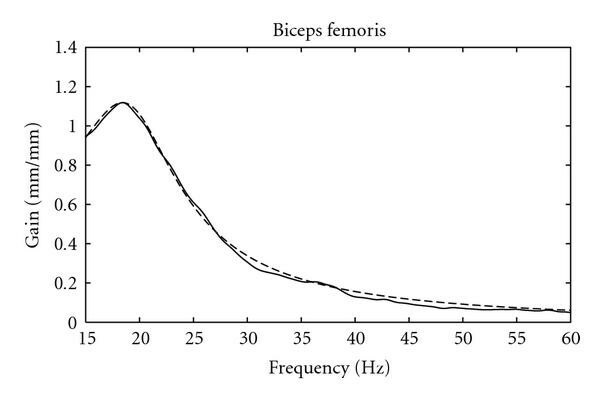 When vibration loads are applied, mechanical and metabolic responses arise from the neuromuscular system [2, 7, 9, 17]; muscles increase their activity to dampen the soft tissue oscillations that occur in response to vibrations Specific WBV frequencies also seem to produce a higher EMGs RMS values than others . Although EMG analysis is a common practice in estimating muscle response to vibratory stimulations, EMG is difficult to measure because vibrations induced in the tissues causes movement artifacts, which interfere with measurement of muscle activity [23, 24]. However, as reported in a previous study, there is a significant correlation between muscle motion and EMG activity . Most of vibration-induced neuromuscular response occurs at the resonant frequencies of the tissues, concurring with the highest levels of muscle activity [23, 26–28]. Local mechanical stimulus characterization (i.e., muscle motion analysis) could be meaningful in discovering proper muscle stimulation and may contribute to suggest appropriate and effective WBV exercise protocols. WBV effects depend on intensity, direction and frequency of vibratory stimulation; however, subject training posture should be considered as one of the most important factors involved. This study concentrates on the characterization and modelling of the muscle motion in individuals exposed to whole body mechanical stimulation while holding different postures on platform. In our study we aim also to evaluate how subject positioning on the platform modifies vibration dumping through the body and in turn, the local vibratory stimulus. However, only two postures were analysed: hack squat position and upright position with heel raised. Patients were impressed by a linear vibratory stimulation sweep in a frequency range from 15 to 60 Hz, while motions of the Rectus Femoris (RF), Biceps Femoris (BF)- (long head) and Gastrocnemius Lateralis (GL) were analyzed; a contralateral analysis between both of the lower limbs was also presented. Muscle motion analysis showed typical 3D trajectories. Muscle displacement was found of different amount on each relative axis; motion components were also found not to be purely sinusoidal neither in phase to each other. Results revealed a mechanical resonant-like behaviour at some muscles, very similar to a second-order system in the frequency range explored. A simple data fitting was then performed and it confirmed a high correlation ( ) between model and experimental data. Contralateral analysis showed that the mechanical behaviour of muscles (both dominant and non dominant leg) was similar. Two limbs muscles motion resulted to be synchronous and symmetric with respect to the sagittal-plane. Body postures selected for the study. P2: upright on feet toes: in upright posture, subjects stand on their feet toes with heel raised. These postures were selected as they are two of the manufacturers suggested positions for WBV training; they also reduce transmission of vibrations to patient's trunk and head . Tiny and lightweight (less than 10 g) three-axial MEMS accelerometers (Freescale Semiconductors) were used to measure accelerations onto patient's skin and on the vibrating platform (the sensors were set to measure acceleration within a 10 g range). The accelerometers were placed at 50% on the line from the anterior spina iliaca superior to the superior part of the patella for RF muscle, at 50% on the line between the ischial tuberosity and the lateral epicondyle of the tibia for BF muscle, at 1/3 of the line between the head of the fibula and the heel for GL muscle and at the centre of the vibration plate to monitor mechanical vibration (Figure 3). MEMS accelerometers were stuck onto muscles belly with medical adhesive tape (3 M). For each postural position, signals from the muscle bellies (both dominant and nondominant leg) were collected contemporaneously (Figure 2). 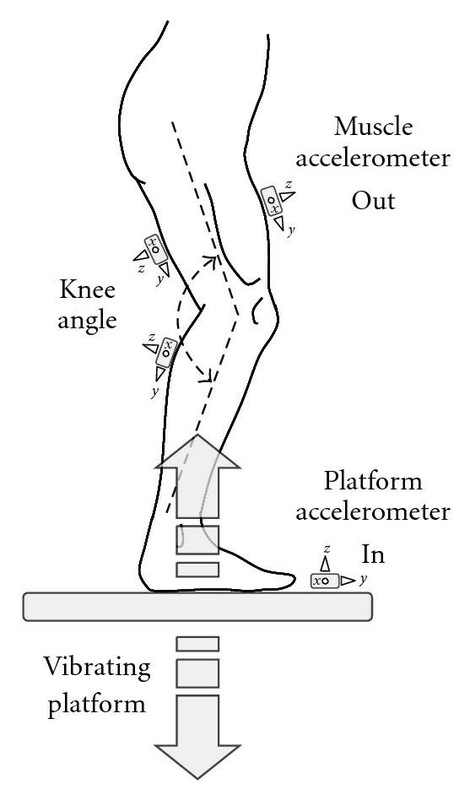 Example of accelerometer arrangement on muscles for both of the lower limbs. The picture shows the position and orientation of the accelerometer on RF muscles. A PC multi-channel 16-bit data acquisition card (NI-DAQCard 6251) was used to acquire acceleration signals. All signals were sampled at 2048 Hz. As mentioned, each of the acquisition (one for each posture), spaced with 60 seconds rest intervals, had a duration of 26 seconds; during this time interval the stimulation frequency, imposed by vibrating plate, raises linearly from 15 to 60 Hz. Accelerations signals provided information related to muscle belly oscillation; they were preprocessed in order to exclude influence of gravity and slow accommodation movements on motion information. Since gravity and subject's accommodation movements contributions are typically confined from 0 to 5 Hz , recordings have been high-pass filtered using a zero-phase 5th-order Butterworth with a cut off frequency of 10 Hz. Muscle and platform displacements were estimated integrating twice the acceleration data after high-pass filtering on each axis. The resultant vectors were then estimated and analysed. The frequency response of the biomechanical system was obtained processing the resultant displacement signals. The actual displacement of the vibrating plate (which was substantially constant in amplitude) was considered as the input signal, while the muscle displacement as system output. Instantaneous frequency was computed for each vibration cycle by estimating two subsequent zero-crossings (with a positive slope) of the signal. Input displacement amplitude, output displacement amplitude and input/output phase difference were estimated for each cycle; gains were obtained by the input/output amplitude ratio. System gain and phase were then plotted against frequency (experimental system response). where is the DC gain, is the natural frequency, and is the dumping ratio. Model parameters ( and ) were estimated by utilizing the values of the dominant peak (amplitude and frequency) of the experimental frequency response; coefficient was estimated minimizing the root mean squared error (RMSE) between model and experimental data. In particular we evaluate the symmetry of muscle motion and the similarity of frequency response between lower limbs. 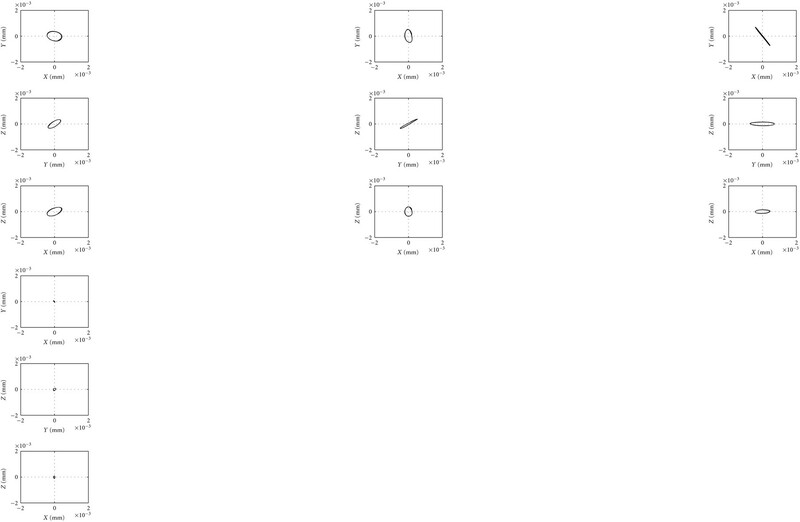 For each posture and for all of the muscles analyzed we computed the correlation coefficient ( ) between the estimated frequency responses (amplitude) of the two limbs muscles. Muscle motion analysis showed peculiar three-dimensional trajectories. Muscle displacement components resulted different on each relative axis; they were also found not to be purely sinusoidal neither in phase to each other. In Figure 4 are shown typical 3D estimated muscle trajectory over time (few vibration cycles are represented). An example of three dimensional displacement of RF, BF and GL muscle belly under vibratory stimulation. The subject was holding the hack squat position while the frequency of the vibratory stimulus was around to 24 Hz. The figure depicts few cycles. The reference position for each muscle was placed at the accelerometer axis'origin. An example of the RF muscle belly trajectories over the ( ), ( ) and ( ) planes, at different stimulation frequencies ((a) = 16 Hz, (b) = 25 Hz, (c) = 40 Hz, (d) = 50 Hz). The figure corresponds to P1 subject positioning. An example of the BF muscle belly trajectories over the ( ), ( ) and ( ) planes, at different stimulation frequencies ((a) = 16 Hz, (b) = 25 Hz, (c) = 40 Hz, (d) = 50 Hz). The figure corresponds to P1 subject positioning. An example of the GL muscle belly trajectories over the ( ), ( ) and ( ) planes, at different stimulation frequencies ((a) = 16 Hz, (b) = 25 Hz, (c) = 40 Hz, (d) = 50 Hz). The figure corresponds to P2 subject positioning. An example of BF frequency response–-(a) amplitude and (b) phase–-over frequency with respect to position P1. In general, acceleration components registered on muscle belly were not in phase one to another. They were also different in amplitude and showed a dissimilar behaviour with the frequency. In general the recorded accelerations confirmed a frequency-dependent increase. 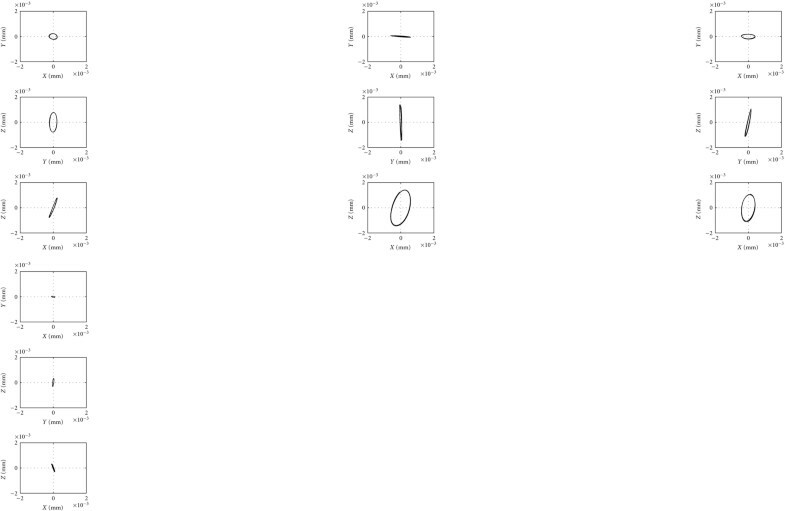 From Figure 5 it is easy to identify a different mechanical response for each axis and, in turn for each plane. 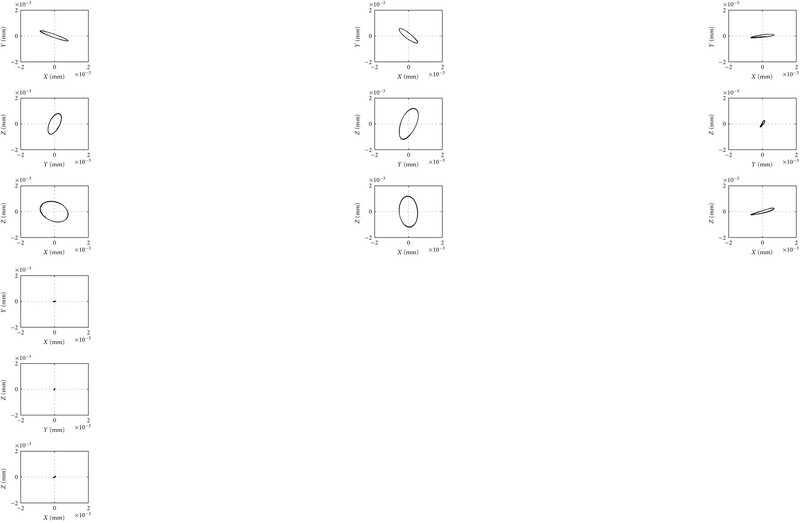 Displacements on -, - and -axis resulted not always in phase, neither pure sinusoids (the figures were not exact ellipses). From figures it is also noticeable that in position P1, RF and BF muscles movements were more pronounced on -axis; the same result was found in all the subjects (see Figures 5 and 6). 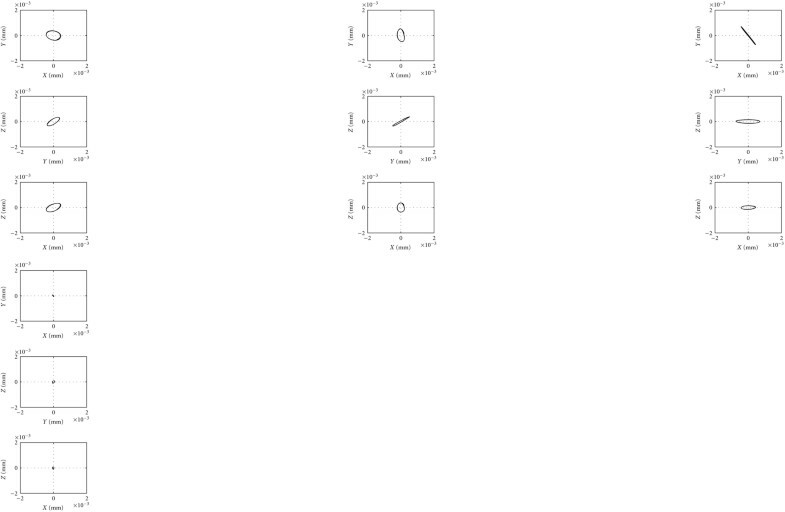 In Figure 7 it is shown that in position P1 for GL muscle movements seemed to be more pronounced on axis. It is worth mentioning that resonant frequency and dumping factor were subject dependant. In P1 position RF and BF resultant displacement showed a resonance-like profile over frequency; this was not evident for GL. In P2 position only the GL muscle showed a resonant-like profile while RF and BF displacements resulted highly dumped (mean normalized displacement 0.4 (mm)/(mm)). RF, BF and GL resonance frequencies and dumping factors depended on subject. In Figure 9 is presented an example of the mechanical behaviour of the three examined muscles, over the frequency range of interest, for one subject and with respect to each posture. 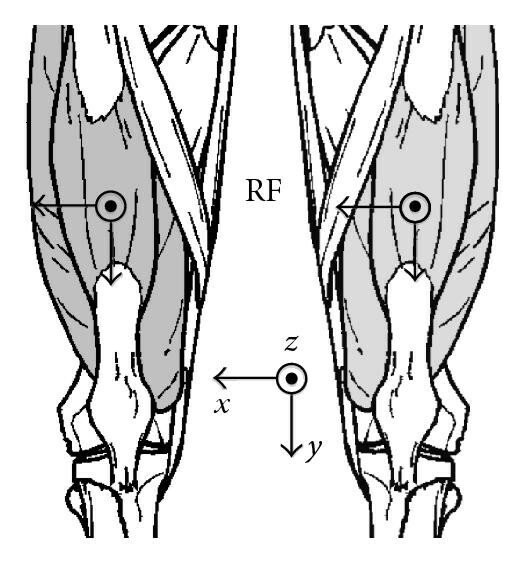 An example of estimated normalised resultant muscle displacements over frequency with respect to position P1 ((a) for Rectus Femoris, (c) for Biceps Femoris, (e) for Gastrocnemius Lateralis) and P2 ((b) for Rectus Femoris, (d) for Biceps Femoris, (f) for Gastrocnemius Lateralis). 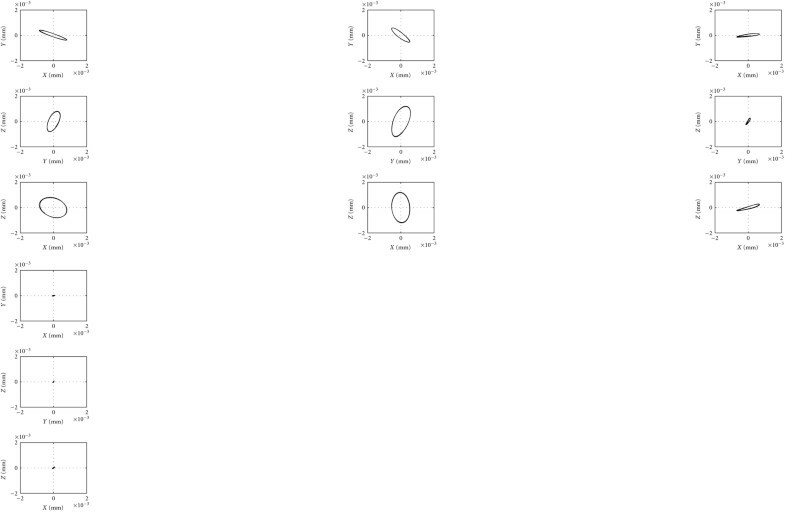 For each posture described, the mechanical response of muscles showing a resonant-like profile was very similar to that of second-order system (Figure 10), as confirmed by the correlation coefficient (Table 1). Frequency response parameters: mean ± SD. An example of second-order system data fitting: continuous line represent the estimated muscle transfer function while the dotted line shows the second-order approximation. In general, the contralateral analysis showed that the mechanical behaviour of muscles was similar. In P1, mean difference between dominant and non dominant limb resonance frequencies ( Fr) was equal to 0.26 ( 1.85) Hz for RF and 0.39 ( 2.79) Hz for BF (Table 2). In P2, Fr for GL was equal to Hz. coefficient resulted very high, suggesting a similar motion of contralateral muscles (Table 2). Contra-lateral analysis: mean ± SD. With respect to position P1, contralateral analysis revealed that motion of both RF muscles (dominant and non dominant leg) was synchronous and symmetric in the sagittal-plane: both RF muscles phase responses were almost identical along - and -axes (synchronicity), while they showed a difference of rad along -axis (symmetry with respect to sagittal plane). The same behaviour was found for both of BF muscles. Interaction of human body with applied vertical whole body vibrations strongly depends on subject's characteristics: anatomy, positioning, muscle stiffness and other individual tissue mechanical properties; some authors also consider the possibility that vibratory stimulation impairs the "muscular memory" process responsible for predictive force . Variations of the mentioned parameters modifies the kinematic chain, through which mechanical vibration propagates into the body, altering muscle local mechanical oscillations. The effects of WBV on muscle motion (i.e., muscle stimulation) depend on intensity, direction and frequency of vibratory stimulation; however, subject training posture, as highlighted by our results, should be considered as one of the most important factors involved. This study aimed to characterize different lower limb muscle motion in individuals exposed to vertical whole body mechanical stimulation. In our study we analysed how subject positioning on the platform modifies vibration dumping and alters the local vibratory oscillation. Two postures were analysed: hack squat position and upright position with heel raised. Muscle motion was successfully measured using tiny and lightweight MEMS accelerometers. 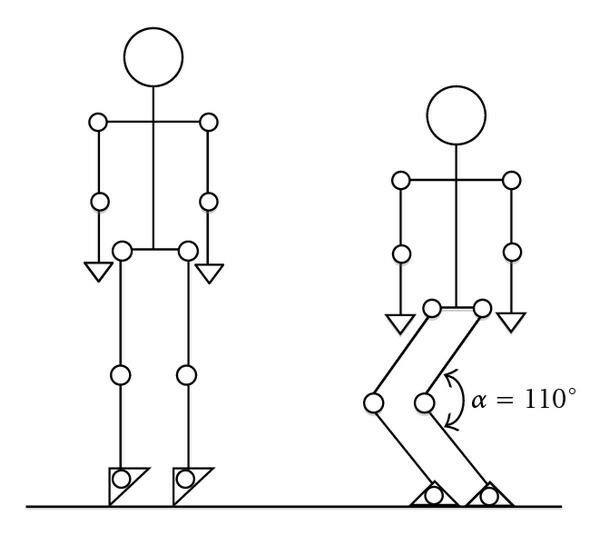 RF, BF and GL muscles motion was here considered: such kinematics can be expressed as a summation of different terms: muscle mean position (depending exclusively on posture), its vibratory displacements and subjects small accommodation movements. Those three kinematic components can be easily separated in the frequency domain: the stationary position and the slow, small postural adjustments are confined to the very low frequencies (0 to 5 Hz) , while frequency content of a muscle motion induced by vibration basically consists of the fundamental vibration frequency (i.e., from 15–60 Hz in these trials) and its superior harmonics. Therefore, in order to consider only vibration related muscle oscillations, standard high pass filtering was combined with double integration providing reliable estimation of the actual muscle displacements. Three-dimensional muscle motion resulted relatively complex: each of the motion component (along the relative -, -, -axes) resulted not always purely sinusoidal neither in phase to each other. RF and BF resonance were observed below 25 Hz while individuals maintain position P1; similarly a GL resonant response was found above 30 Hz in position P2. The analysis of the resultant estimated displacements confirmed that BF and RF muscles achieved the maximum oscillation (i.e., receive the maximal vibration stimulation) in position P1 while GL maximal oscillation was achieved in position P2. It is worth mentioning that only for this posture/muscle combinations a resonant-like behaviour was clearly visible; however further investigations will be considered to assess the variability of muscle response after multiple vibratory stimulations and different rest periods. Since experimental data resembled a second-order system like response (suggesting a kinematic equivalent behaviour of a wobbling damped oscillating mass) a simple data fitting was performed. The high correlation coefficient ( , see Table 1) between the empirical frequency response and analytical second-order transfer function then confirmed the validity of the assumption. Contra-lateral analysis showed nonsignificant differences between dominant and nondominant lower limb; both lower limbs muscles motion resulted to be synchronous and symmetric with respect to the sagittal-plane. However muscles mechanical resonance characteristics (frequency and dumping factor) depended on subject. In conclusion, as highlighted in this study, vibratory induced muscle oscillations strongly depend on subject's posture; as suggested, our results confirmed the meaning of a proper positioning in vibratory stimulus transmission. Since WBV training is included in many fitness and rehabilitation centres exercise programmes, improvements in current knowledge would be helpful in discovering effective exercise protocols. Assuming the hypothesis of correlation between muscle motion and EMG activity , WBV muscle stimulation programmes have to take into account the posture hold by subject on platform, and in turn, the local muscle mechanical oscillation (i.e., local muscle stimulation). In particular our results suggested that BF and RF muscles may receive the maximal stimulus in position P1 while the for GL muscle stimulation may be preferable position P2. However, maximizing muscles motion could act in producing more muscle lengthening, and in turn higher muscle activation. In addition, since this study involved untrained male subjects, studies with female subjects should be performed to compare with the results obtained for male subjects. The authors are grateful to TSEM S.p.A. for providing vibrating platform device.